Let's face it: We're getting old. 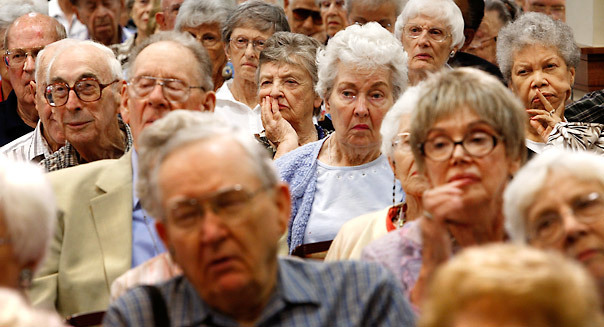 The percentage of Americans age 65 or older has been steadily on the rise over the decade. It hit 14 percent in 2012 -- and the Census Bureau projects that by 2050, 21 percent of Americans will be at least 65 years old. Our aging demographic profile has created some immense challenges, particularly in the areas of Social Security and Medicare. But it also opens up opportunities for enterprising businesses that provide necessary services to an aging population. Companies that identify demographic trends are best positioned to profit from them. Here are five that are in the right place at the right time -- and if they're smart about their strategic vision, they (and their investors) could reap a lot of growth from an aging customer base. Medtronic is a maker of medical devices, specializing in cardiovascular products like pacemakers, valve replacements, and various items to help repair problems in the circulatory system. But Medtronic also serves a number of other areas, including ways to treat spinal problems, diabetes and chronic pain. One downside for investors is the fact that beginning this year, Medtronic has to pay a surtax on medical-device revenue, which was imposed to help pay for the health care reform law. Even with the tax sapping its profits, though, Medtronic will benefit from the needs of more patients needing treatment for heart-related illnesses and other ailments using its devices. This iconic drugstore chain has been around for decades, paying ever-higher dividends to shareholders. As prescription drug use grows, Walgreen stands to have more traffic in its stores, and that in turn should drive more sales of the unrelated retail goods that the company stocks on its store shelves. In addition to benefiting from older Americans, Walgreen has made a big push recently for international growth. Aging populations in economies around the world represent a great opportunity for Walgreen to expand beyond its domestic stronghold. MetLife is one of the biggest providers of life insurance in the country. Insurers have gone through hard times in recent years, as poor investment returns and high payouts on certain types of insurance left them reeling from the financial crisis five years ago. But for investors, MetLife's moves have made it a stronger stock. It's decision to stop offering long-term-care insurance has been tough on older Americans seeking protection from high health care costs, but its core insurance business benefits from the longer lifespans of an aging population. With some favorable products tailored to retirees, MetLife stands to make big strides forward in the years to come. The scope of Johnson & Johnson's business is wider than many people realize. In addition to its well-known consumer brands like Band-Aid, J&J also has sizable pharmaceutical and medical-device arms. Though many of its rivals have broken themselves up into smaller businesses to let the individual parts focus on their respective specialties, Johnson & Johnson still sees value in its conglomerate status. Unfortunately, J&J has had problems with its hip replacement products, which led to recalls of certain devices. But the company has overcome similar short-term problems in the past. Given the size of J&J's orthopedics business, which by itself dwarfs many of the companies that specialize in orthopedic devices, Johnson & Johnson still stands to gain from rising demand once it addresses any safety concerns. Omega Healthcare is a real estate investment trust that specializes in owning and operating health-care-related properties, with an emphasis on skilled nursing, assisted living, independent living, and rehabilitation facilities. A growing pool of retirees seeking the community environment that these facilities offer has led to higher demand in recent years, and those trends are only likely to continue as these communities benefit from the network effect of having older peers recommend them to (relatively) younger prospects. For investors, the real estate investment trust framework ensures a steady stream of income for your portfolio. On that score, Omega's dividend yield of 6 percent stands out as particularly attractive, topping several other similar health care REITs. Motley Fool contributor Dan Caplinger has no position in any stocks mentioned. The Motley Fool recommends Johnson & Johnson. The Motley Fool owns shares of Johnson & Johnson and Medtronic.